Sources that integrate two artificial optical material concepts may drive ultrafast "Li-Fi" communications. In many applications, Li-Fi through-the-air optical networks potentially offer major advantages over Wi-Fi and other radiofrequency systems. Li-Fi nets can operate at extremely high speeds. They can exploit an extremely broad spectrum of frequencies. They avoid the interference problems that plague radiofrequency systems, which are especially problematic in high-security environments such as airplane cockpits and nuclear power stations. They are less open to hackers. And while their range is relatively limited, they don't need line-of-sight connections to operate, said Evgenii Narimanov, a Purdue University professor of electrical and computer engineering. Today's Li-Fi nets can't fully achieve all these potential benefits because they lack suitable light sources, he said. But designs that integrate two optical material concepts into "photonic hypercrystals" may fill this gap. Narimanov first proposed this concept in 2014. This month, he and colleagues at the City College of New York reported demonstrations of photonic hypercrystals with greatly increased light emission rates and intensities in the Proceedings of the National Academy of Sciences (PNAS). 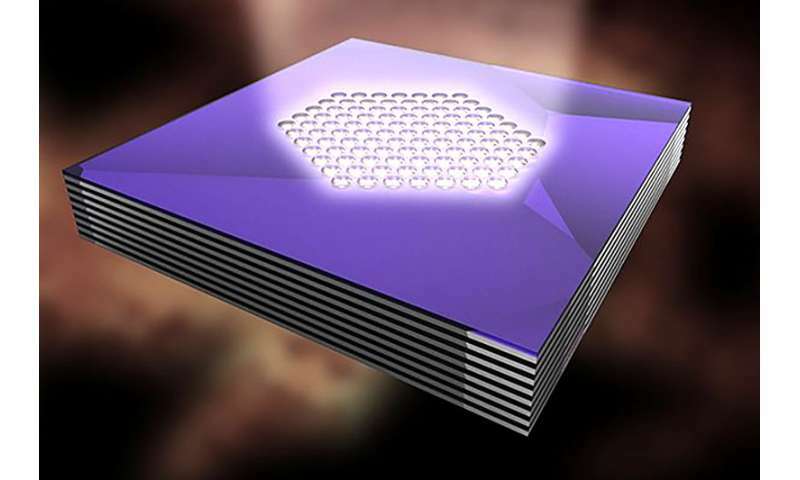 Photonic hypercrystals combine the properties of metamaterials and photonic crystals, both "artificial" optical materials with properties that are not usually found in nature, Narimanov said. Metamaterials are created from artificial building blocks that are much smaller than the wavelength of light, while in photonic crystals the size of the "unit cell" is comparable to this wavelength. While these two types of composite materials generally show very different properties, the photonic hypercrystals combine them all within the same structure. Photonic hypercrystals are based on one type called hyperbolic metamaterials, which can be built with alternating layers of metal and dielectric materials—where the electrical current can only travel along the metallic layers. "Generally, for light, metals and dielectrics are fundamentally different: light can travel in dielectrics, but is reflected back from metals," Narimanov said. "But a hyperbolic metamaterial behaves as metal along the layers and as a dielectric in the direction perpendicular to the layers, at the same time. For light, hyperbolic media is, therefore, the third estate of matter, entirely different from the usual metals and dielectrics." Among the interesting properties that this structure produces, the metamaterial accommodates a large number of photonic states, allowing spontaneous light emission at extremely high rates. "For a light source, the problem is that this light in the hyperbolic metamaterial can't get out," said Narimanov. Enter photonic crystals—periodic nanostructures that can manipulate optical interference to optimize light transmission. In the integrated photonic hypercrystals presented in the PNAS paper, the hyperbolic metamaterial consists of alternating layers of silver (the metal) and aluminum oxide (the dielectric). Hexagonal arrays of holes milled into the layers create the photonic crystal. In the design, the visible light is emitted by quantum dots (semiconductor nanoparticles that can emit light) embedded in one of the layers that form the hyperbolic metamaterial. The result: extremely high levels of control and enhancement of the emitted light. "These photonic hypercrystals were fabricated at the City University of New York's Advanced Science Research Center using standard nano- and micro-fabrication techniques such as thin film evaporation and focused ion beam milling," said Tal Galfsky, a CCNY graduate student who is lead author on the PNAS paper. "These techniques are scalable with modern industry capabilities. " Vinod Menon, CCNY professor of physics, is senior author on the paper, and CCNY graduate student Jie Gu also contributed to the work. The work reported in PNAS demonstrates that "on a fundamental level, the problem of designing photonic hypercrystals has been solved," said Narimanov. He cautions, however, that significant engineering challenges must be overcome before these devices can be commercialized. Among these barriers, the demonstration devices are pumped optically by a laser, but commercial versions will need to be driven electrically and incorporate either semiconductor or organic LEDs, he said. As they mature, photonic hypercrystals also may fill many other demanding roles in ultrafast optoelectronics. One of the most promising avenues of research, Narimanov suggested, is to create more efficient versions of the single-photon guns employed in quantum information processing. Why do people want this Lifi garbage? It stops working when the receiver is covered, like with a magazine or a hand. Photonic "hypercrystals" have a lot more interesting application than this shortsighted networking paffle that, years after its invention still has practically no market uptake because its so impractical.